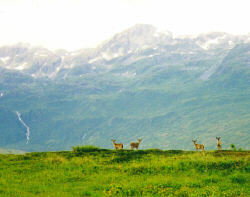 Guests of AlpenView are exposed to many different species of wildlife. 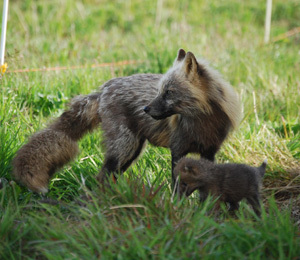 In camp, at the lodge or in the field, wildlife are always a part of the picture in remote areas of Kodiak Island. AlpenView offers a variety of brown bear viewing opportunities and we hope one will appeal to your interests. 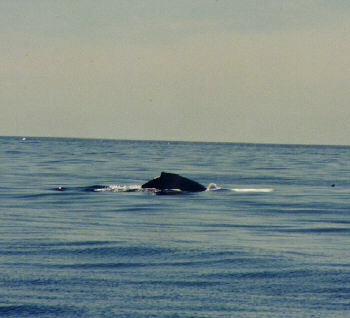 All options include meals, lodging, guides and transportation. At The Camp. For the serious viewer/photographer, our most intense opportunity is a stay at our Ayakulik Out-Camp. The camp is centered in one of the most densely populated brown bear habitats on earth. 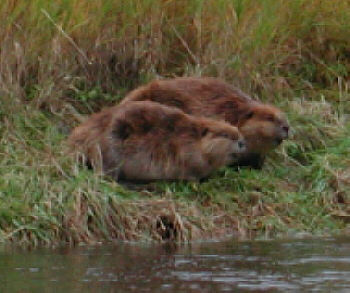 Located on the banks of the Ayakulik River and surrounded by the Kodiak National Wildlife Refuge, bears are so frequent that it is necessary to surround the camp with a 5000 volt electric fence. Viewing starts right at the camp and continues via the river boat and hikes to different viewing sights. 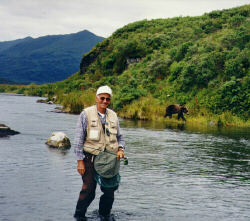 The bears are primarily feeding on sockeye salmon which run up the Ayakulik River in the hundreds of thousands. The bears share the salmon with red fox and bald eagle. 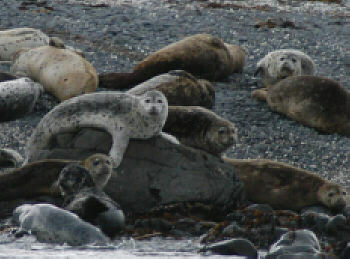 A wide variety of other creatures share the scene on a daily basis. Check out multi day bear viewing at the out camp. At the lodge. 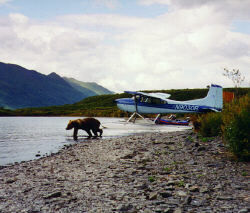 Another great viewing opportunity is to stay at AlpenView Wilderness Lodge and fly-out for bear viewing. 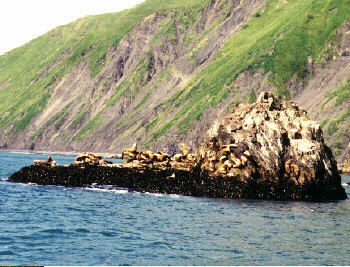 AlpenView maintains permits for wildlife viewing at several prime locations on The Kodiak National Wildlife Refuge. 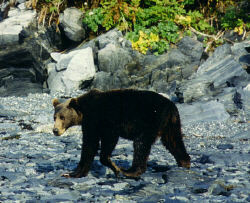 Viewing starts right at the lodge where bears are occasionally seen walking the beaches. The flight seeing portion of the fly-out is beautiful and exciting it’s self and several animals are spotted from the air. 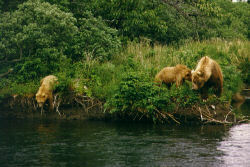 Once on the ground, a short walk will place viewers at a prime sight to see bears feeding on salmon. 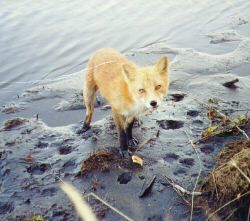 As at the camp, a wide variety of other creatures share the scene on a daily basis. 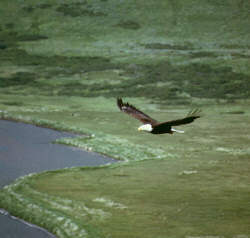 During portions of a lodge visit when not flying-out, viewers can choose between several wildlife viewing activities. 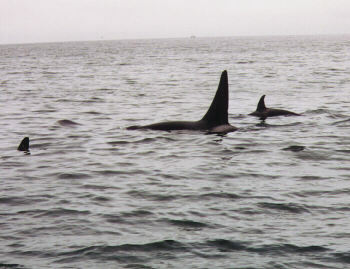 Whale watching for gray, humpback and orca whales, viewing seals, sea lions and a wide variety of sea birds can all be accomplished in our boats and kayaks. A hike to the high country back of the lodge provides opportunities to see black tail deer, mountain goat, bear and other animals. Three, four and seven day trips are available. The Viewing season at the lodge begins in mid July and runs through early September. For a full explanation of prices and current availability please see the programs page. Last but not least, a client partaking in any of our sport fishing trips will enjoy several opportunities to view bears and other wildlife. Multi day trips are available starting with two days (one night). The Viewing season at the camp begins in mid July and runs through early September. 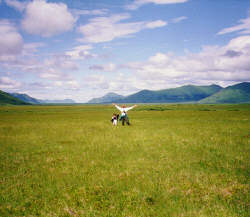 a fly-out bear viewing trip. 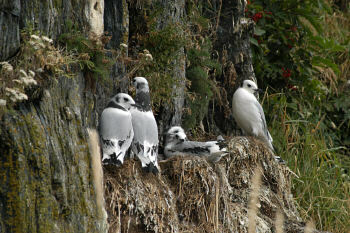 Left: Beaver Top: Nesting sea birds.